After a blissful two weeks off of work, and I really mean off, I am back into somewhat of a groove of a schedule. I spent my winter break and really focused on myself. I watched TV, read books that I want to read for myself, and spent time with family and friends. I really wanted another week to try and get myself back into a school mindset, but that wasn't going to happen. I went back to school on Monday and what to my wondering eyes and ears did we focus on during our staff meeting? As I stated in my previous blog post, I am at a new school and district this year, and I feel truly blessed to be a part of an incredible teaching community. We spent our morning focusing on ourselves. For the beginning part of the day, we had the option to participate in a yoga session. I put on my comfortable workout clothes and attended. Now, yoga is not really my thing, but I decided to give it a shot. I know there are a lot of people out there that are devoted to yoga, but I have more of this mindset: NAMASTE IN BED. I love to workout, but I don't have the right mindset to relax and let go. It was a new experience for me, and I like the calm mindset, but it will take a lot more practice for me to truly hone-in on relaxing my mind. We also spent some time learning about a balanced life (and even participated in some events for balanced) and how the brain and our mood is affected by the amygdala. A few of our staff members attended a brain research PD and are now sharing their learning with us. They will even be coming to the classroom to teach these lessons to my students. As someone with a B.S. in Psychology, I am thrilled to be incorporating this into my classroom and teaching students the importance of taking care of theirselves and their minds. I also can't wait to share what I learn with you! One of the ideas that we are implementing, as a staff, is the wellness challenge. We have a list of activities that we can complete each day to earn points and try to win prizes. 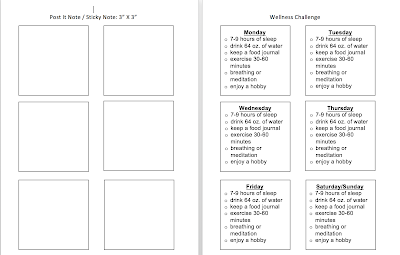 I love this idea, because it helps keep me accountable, but it doesn't focus on weight loss, it focuses on overall wellness. Are you interested in working on your wellness? Click the image below to download a free template. You can choose to print it on post-it notes or just as the list itself! I LOVE the idea of a staff wellness challenge! I'm going to suggest this to my admin! I really need to work on this. Resolution for the 2018-19 school year! I love that your school did this!! What a fantastic idea! Yoga is hard to get used to, but it’s one of my favorite ways to treat myself!